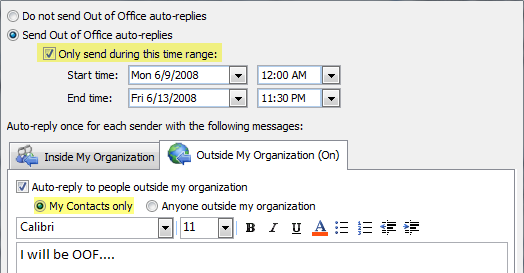 Didn't notice earlier— one of my favorite Outlook/Exchange tools is now compatible with Outlook 2010. Outlook Spy is primarily a tool for Outlook/Exchange developers, but Exchange administrators also find it useful. It allows you to look under the hood of mailboxes and messages. Created by Dmitry Streblechenko, an Outlook MVP, Outlook Spy has been on my list of "must have Exchange tools" for as long as I can remember. Released in November 2009, the latest version of Outlook Spy (v2.15) adds Outlook 2010 compatibility. You can download Outlook Spy 2.15 from Dmitry's web site. Registration for a single user license is $49.99. It's been worth every penny and more for me. I also like the free MFCMapi tool on Codeplex - Microsoft's open source community site where you'll find a lot of useful tools and apps along with the source code. MFCMapi is a compact executable (760-873K) and doesn't require installation. It was created by Microsoft's Stephen Griffin. It's available in both 32-bit and 64-bit versions. Send On Behalf access allows a user to send mail on behalf of the mailbox owner. Here's a script that lists all users with delegates. When troubleshooting antispam issues, particularly false positives (legitimate email incorrectly tagged as spam), frequently you run into scenarios where Exchange Server antispam features seem to be working correctly but you still see messages being delivered to the Junk Mail folder instead of the Inbox. For instance, you whitelist a sender or sender domain, or add the sending IP address to the IP Allow List. You find message(s) from the whitelisted sender, domain or IP address still being delivered to the Junk Mail folder. You open the message and check the antispam headers - as expected, Exchange has stamped the message with a SCL of -1. When troubleshooting Exchange antispam issues, it's best to turn off Microsoft Outlook's own antispam filtering. This is something Outlook does in addition to Exchange's server-side antispam agents. 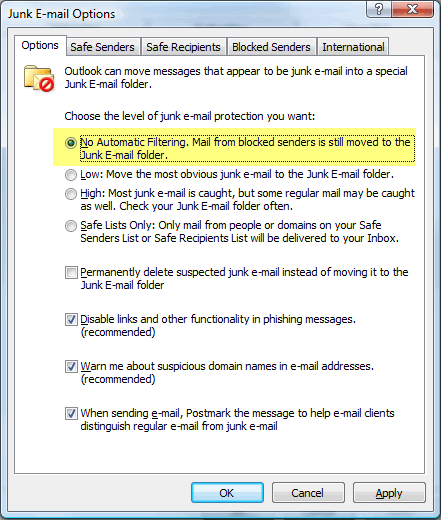 By default, Outlook's Junk E-mail Filter is turned on and set to Low. 1. Go to Tools menu | Options | Preferences tab | under E-mail section -> click the Junk Mail button. After a user empties the Deleted Items folder, although these items disappear from the view of the mailbox, they are not completely deleted. They are retained till the Deleted Item Retention period expires in what's fondly referred to as the Dumpster— not to be confused with the Transport Dumpster maintained by Hub Transport servers. 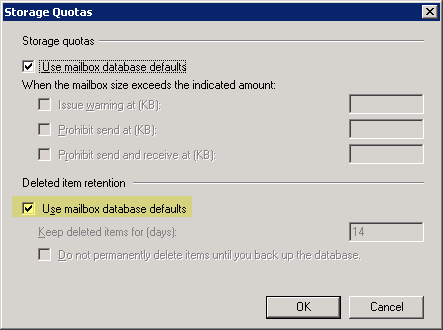 Deleted Item Retention (DIR) can be configured on the Mailbox Database. It is set to 14 days by default. 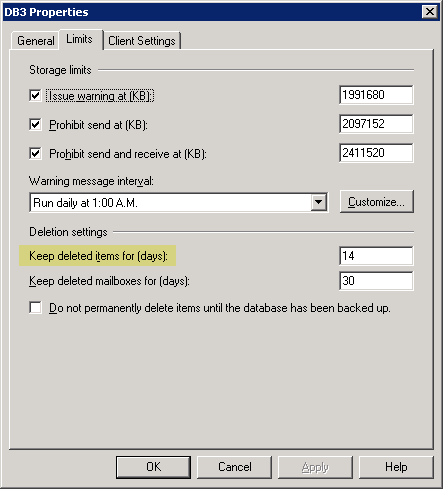 The other related parameters that can be configured on the MDB include deleted mailbox retention period and the option to not purge deleted items until the MDB has been backed up. Why is it a good idea to not purge the dumpster till the Store has been backed up? If not checked, items in the Dumpster will expire after the Deleted Items Retention period, and be permanently lost! If the Dumpster is purged before a backup takes place, the item is lost forever, with no way to recover it. Retention Policies in many organizations require that all messages or mailbox items should be recoverable. 5. Click OK to close the Storage Quotas property page | click OK to close mailbox properties. 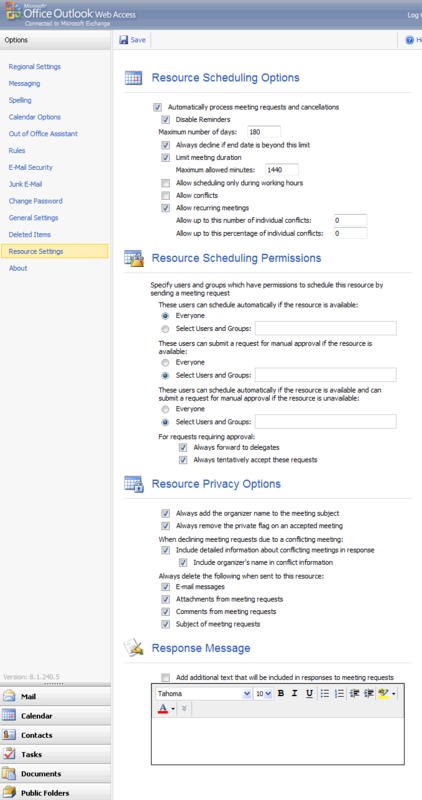 (See Applying Managed Folder Policy to more than one user for more examples. The list of filterable properties that can be used in the -Filter parameter: Exchange 2007 RTM | SP1). However, simply setting the RetainDeletedItemsFor property does not apply the new retention period to mailboxes. Remember the checkbox in the console for Use mailbox database defaults? How do we uncheck that using the shell? 3) RetainUntilBackupOrCustomPeriod— a third value, if you've also selected the option not to purge the Dumpster before the Store's backed up. At this point, I wouldn't blame you if you instinctively proceed to use the Set-Mailbox cmdlet to flip the DeletedItemFlags property from DatabaseDefault to RetainForCustomPeriod. However, this doesn't work. What Get-Mailbox actually displays as the DeletedItemFlags is a calculated property— properties which are calculated and displayed for ease of administration, but aren't actual properties that can be modified using the corresponding Set-Whatever cmdlet. The property we need to modify is called UseDatabaseRetentionDefaults. It's a boolean property— valid values can be $true or $false. Doesn't the output from the above command include the Deleted Items folder? PAL creates some great reports that provide a better analysis of Exchange performance data than actually looking at perfmon counters all day. Mike Lagase has more details in his blog post "Performance Troubleshooting using the PAL tool". Although the original sender and recipient fields were added, the original SCL stamped on the quarantined message wasn't visible.  The OriginalScl property was exposed in Exchange 2007 SP1, and is now included in the updated form in that post. Installing the updated form exposes the original SCL for messages in the quarantine mailbox, as seen in Figure 1. Where are mailbox last logon, client IP address, and other details in Exchange 2007? In Exchange Server 2003/2000, expanding a Mailbox Database provides information about mailboxes in a database, last logon/logoff times and account(s) that logged on to mailboxes (see 'Displaying Client IP Address in Exchange System Manager' for details). Figure 1: In Exchange 2003, the Logons node displays Store logon-related information. Click here to see a bigger screenshot. 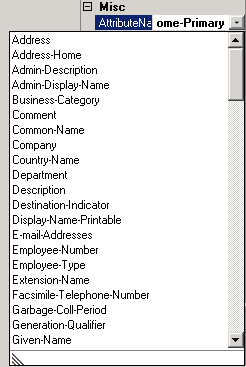 In Exchange Server 2007, these details are not displayed in the EMC. The reasons are not hard to guess. These details are retrieved by querying the mailbox database. In Exchange 2003, these were displayed when you selected the mailbox database, resulting in a single mailbox database being queried. 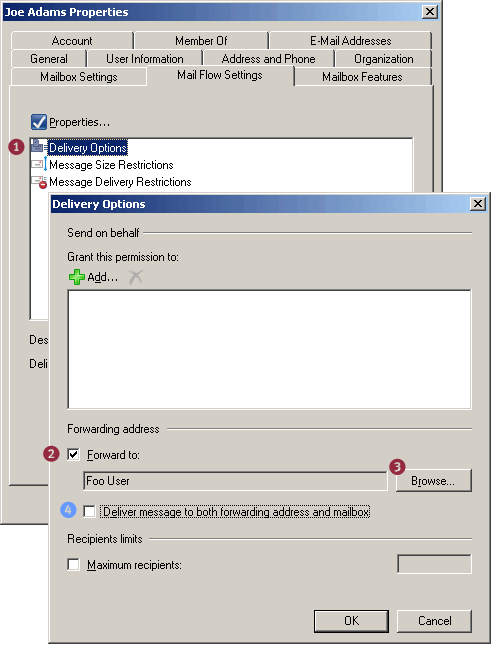 In Exchange 2007, mailboxes are displayed when you select Recipient Configuration -> Mailboxes, and depending on the selected scope/filter, the console displays mailboxes from the entire organization. Querying all mailbox databases on different servers in a distributed organization can become very slow, generate a lot of extra network traffic— terribly inefficient. Instead, why not allow the administrator to query for these details when they're actually required? The shell provides you the flexibility to only get the fields you want, only for the mailboxes you want, making it much more efficient. If you manage smaller Exchange deployments and love your GUI management tools, you may not fall in love with the idea. (But that debate's already settled, and you're going to have to learn some bit of Exchange shell to be able to manage Exchange 2007 and later. The good news is, it's cooler, easy-to-use, well-documented by now, and comes with plenty of help!). The Get-LogonStatistics cmdlet provides the following logon-related information. The command can be constrained to a mailbox database (get-logonstatistics -Database "MyDatabase" | fl), a mailbox server (get-logonstatistics -Server "MyServer"), or a particular mailbox. In ESM, the Mailboxes node of a Mailbox Store displays mailbox-related information such as mailbox size, number of items, and last logon/logoff. Figure 2: In Exchange 2003, the Mailboxes node displays mailbox-related information. Click here to see a bigger screenshot. It can also be constrained to a -Database, -Server, or mailbox. OOFs can be controlled per domain using Remote Domain settings. By default, setup creates the default Remote Domain for address space *. (As with Connector namespaces, * translates to all domains for which Exchange isn't authoritative/has an Accepted Domain for, and doesn't have an explicit Remote Domain for). None: OOFs are disabled for the remote domain. External: Allows only external OOFs to be sent to the remote domain. OOFs created using legacy Outlook clients and those sent by Exchange 2003/2000 servers will be not be allowed. If blocking OOFs to external domains in Exchange 2003/2000, this allows you to restrict legacy Outlook clients from sending OOFs, but allow Outlook 2007/Exchange 2007 users to send external OOFs. ExternalLegacy: Allows external and legacy OOFs to be sent to the remote domain. InternalLegacy: Allows internal and legacy OOFs to be sent to the remote domain. The InternalLegacy setting sends internal OOF messages to a Remote Domain. If verbiage or content of internal OOFs isn't something you want to share with the outside world, do not use this for Remote Domains. The InternalLegacy option can be useful in distributed organizations with multiple address spaces and multiple email systems, or specific cases where you may want to share such information with a trusted organization. Why is OOF an OOF and not an OOO? New whitepapers have been released today on TechNet. This whitepaper discusses the different components of Continuous Replication— used by LCR, CCR and SCR, how replication works, backups and log file truncation, what happens during scheduled and unscheduled outages, and how Continuous Replication compares with other replication solutions. This whitepaper discusses planning and operational issues faced when dealing with large mailboxes, including planning storage, long database backup and online/offline maintenance times. An updated version of the Mailbox Server Role Storage Calculator (let's just call it Storage Calculator or StorageCalc? :) has been released. More details about v14.7 in Ross' post on the team blog: Updates to the Mailbox Server Role Storage Requirements Calculator. 1. I often forget to turn off OOFs once I'm back in the office, or forget to set these up in the first place— setting up OOFs isn't exactly a priority for many when leaving for a business trip or a vacation. 2. At times I don't want to provide the same information to external senders that I provide to internal ones. 3. I don't want to broadcast to the whole world about being out of office. However, OOF auto-responses are sent out exactly once per sender - the very first time the sender sends you a message. 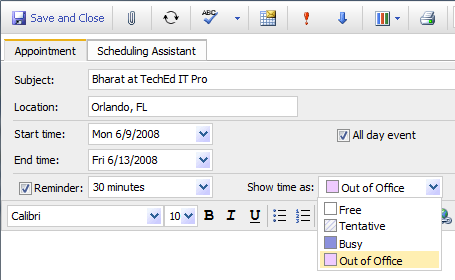 When planning to be out of office, it's a great idea to setup a Calendar appointment for yourself and mark the status as out of office instead of busy. 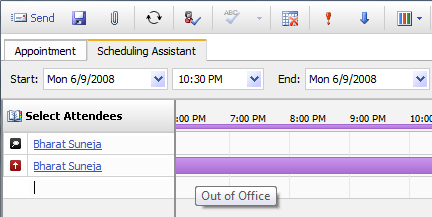 When another user tries to schedule a meeting with you during the period you're out of office, your Free/Busy information does not show your OOF status. Setting up the OOF appointment in your Calendar allows meeting organizers to instantly identify whether you're just busy or actually out of the office during the period. - Why is OOF an OOF and not an OOO? In Exchange Server 2003, mail for a recipient can be forwarded to an alternate recipient by modifying the recipient's Delivery Options in ADUC | recipient -> properties | Exchange General tab. If you need to forward mail to an external email address, you cannot simply type the address in Delivery Options. A (mail-enabled) Contact needs to be created in AD first, and Delivery Options modified to point to the Contact. Exchange Server 2007: In Exchange Server 2007, these tasks remain the same. However, instead of using ADUC to accomplish them, you use the EMC or the shell (aka "EMS"). The new term for a Contact is MailContact. Next, we set the recipient's Delivery Options to deliver to the alternate recipient. Set-Mailbox "Joe Adams" -ForwardingAddress "[email protected]"
Remote Domains are a bunch of settings, such as message formats, character sets, and OOFs, for messages sent to particular remote domains. The default Remote Domain setting applies to address space * - that is, all remote domains for which an explicit Remote Domain setting does not exist. Figure 2: The Allow automatic forward setting for remote domains impacts client-side automatic forwarding, and is disabled by default. However, this setting only applies to client-side forwarding. 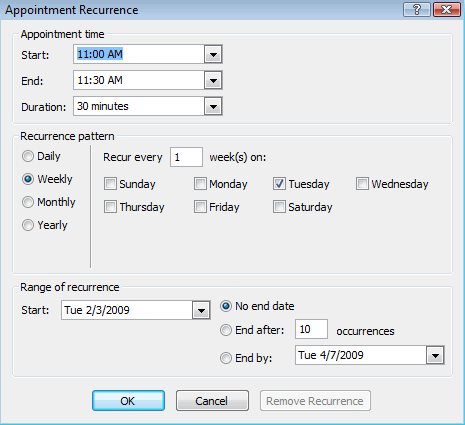 For instance, if a user creates a rule in Microsoft Outlook to automatically forward mail to an external email address, the default setting does not allow it. To enable automatic client-side forwarding of mail to external addresses, select the Allow automatic forward checkbox in a remote domain's properties | Format of original message sent as attachment to journal report tab (Yes, the tab is mislabeled. It is the "Message Formats" tab... :). Server-side forwarding setup by an administrator is not impacted by this setting. The last time we took a look at the timezone changes was when the August 2007 cumulative time zone update was released (Read previous post: "DST 2007: August 2007 Cumulative Timezone Update for Windows operating systems"). The August 2007 update included new timezone data for Caucasus Standard Time, Armenian Standard Time, New Zealand Standard Time, GTB Standard Time, and Jordan Standard Time. Some updates were minor - such as changing the display name of a time zone. - Australia: Central Australia, Eastern Australia and Tasmania Standard Time - these start and end on the same day. Updates in the above list reflect the latest time zone changes made around the world after the Aug. 2007 Cumulative Timezone Update was released. If you've already applied the previous updates affecting your locale, and rebased appointments, the latest update will not change anything for you. Also note, this is a cumulative update. It includes all previous timezone updates. In "HOW TO: Grant Full Mailbox Access permission", we saw how to assign and view mailbox permissions, including Full Mailbox Access. Here's how you can get a list of mailboxes with explicitly-assigned (i.e. not inherited) Full Mailbox Access permissions. Instead of running this against all mailboxes in the Organization, it makes sense to filter it against a sub-set of mailboxes. Mailboxes returned by the Get-Mailbox command can be filtered using -Server, -Database, -RecipientTypeDetails, and -OrganizationalUnit parameters. Note, the -Filter parameter can also be used and allows granular filtering of mailboxes that are returned, based on a number of filterable properties. This produces a long list of permissions - inherited and assigned explicitly to the mailbox(es). Now we have a list of all mailboxes with explicitly assigned permissions. Similarly, you can filter users that have other mailbox permissions assigned, such as SendAs, DeleteItem, ReadPermission, ChangePermission, ChangeOwner, or ExternalAccount. The following code lists mailboxes with the SendAs permission assigned. Unlike FullAccess mailbox permission, SendAs is an Active Directory permission. 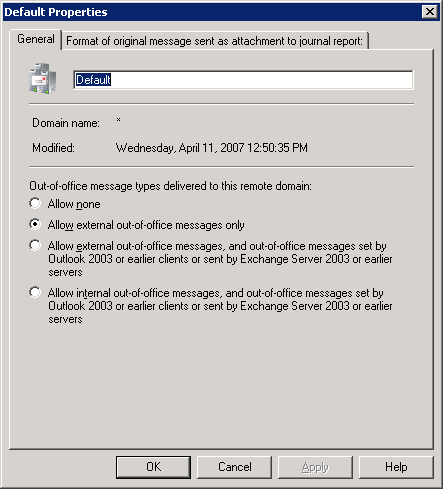 Exchange Server 2003/2000's Recipient Policies can have settings to generate email addresses for recipients, and Mailbox Manager settings to manage mailbox content. (The Exchange Server 2007 equivalents are 1. Accepted Domains + Email Address Policies to generate email addresses, and 2. Managed Folder Mailbox Policies (with default or custom Managed Folders + Managed Content Settings) to manage mailbox content). When creating these policies, one can either use a single policy with both types of settings, or use separate Recipient Policies for both purposes - one to generate email addresses for recipients, and other(s) with Mailbox Manager settings to manage mailbox content. The latter approach (separate policies) is more common. 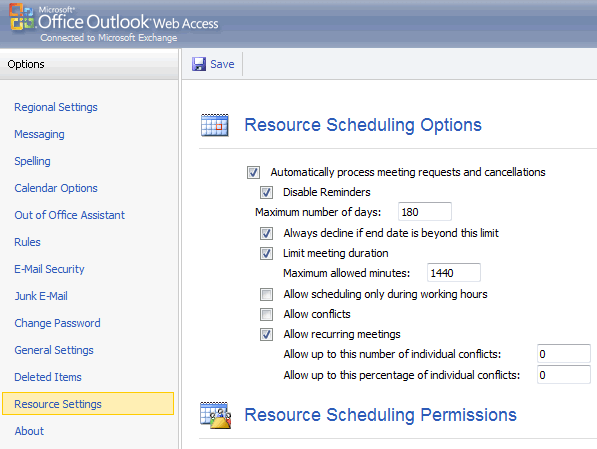 Scenario1: Single policy with Email Addresses and Mailbox Manager settings applied. Recipient Joe Adams is not managed by policies (in ADUC -> Joe's account properties | E-mail Addresses tab, Automatically update e-mail addresses based on recipient policy is unchecked). None of the settings - Email Addresses or Mailbox Manager, get applied to that user. 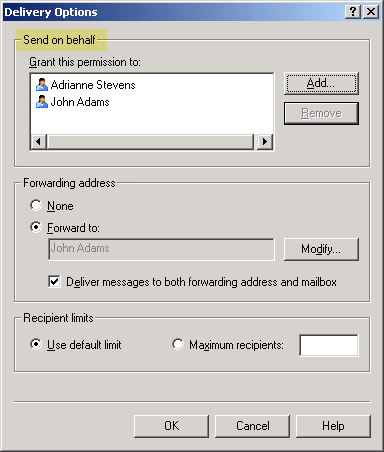 Scenario 2: Two separate Recipient Policies are applied - one with Email Addresses and the other with Mailbox Manager settings. Recipient Joe Adams is not managed by Recipient Policies. The policy with Email Address settings does not get applied to Joe. The second policy with Mailbox Manager settings does get applied. Exchange Server 2007 avoids these scenarios completely. The functionality of generating email addresses - Accepted Domains + Email Address Policies, is separate from the functionality of managing mailbox content, which is available through Managed Folder Mailbox Policies. 2. Exchange Server 2007: Why aren't Managed Content Settngs applied? Some truths you live with for a lifetime, like Outlook users cannot send email using an alternate email address (with Outlook in MAPI mode - read previous post: "HOW TO: Send as alternate email address"). Others change as Microsoft Exchange evolves, either through new versions of Exchange server, or service packs and hotfixes. Disabled mailboxes cannot receive email. Or rather, could not receive email. This has been true all this while, and hasn't changed in Exchange 2000, Exchange Server 2003, including SP1 and SP2. The reason is described in Microsoft KBA 319047 - "You receive a non-delivery report when you send a message to a disabled account". - A common scenario: An employee leaves. You disable the account, as part of a standard operating procedure followed in most organizations. You assign his/her manager/co-worker/replacement permissions to access the mailbox. If the mailbox is disabled, they can't access it! - The Application Event Log is flooded with annoying Event ID 9548s, informing you that the disabled account does not have a msExchMasterAccountSID attribute populated - something most Exchange administrators have probably gnashed their teeth at a few times a day. Workarounds exist to populate the msExchMasterAccountSID attribute with the well-known SELF SID (KBA 322890 "How to associate an external account with an existing Exchange 2000 mailbox"), but not something you want to do on a regular interval after every account, or a bunch of them, are disabled. The hotfix mentioned in KBA 903158: "A hotfix is available to modify the way that Exchange Server 2003 handles a disabled Active Directory user account that is associated with an Exchange Server 2003 mailbox" changes that behavior. It makes the Store act as if a disabled account with a null/empty msExchMasterAccountSID attribute actually has the SELF SID. All the above actions (and more) complete successfully for disabled accounts. Yes, disabled accounts receive email if you have this hotfix applied - or any subsequent hotfix that updates Store.exe to version 6.5.7234.3 or later. 2.Receive mail only from: a particular Distribution Group (use a Distribution Group with no members). Continuing from where we left off in that post, another scenario is being able to add Active Directory attributes to the new user object created by New-Mailbox. Note, the New-Mailbox command can populate only a limited set of AD attributes for an object - those related to Exchange. These are listed in the documentation for New-Mailbox. To add AD attributes, the logical choice would be to use the New-User command to create the user, and mailbox-enable it by using Enable-Mailbox. This would work great, except for the fact that the New-User command doesn't exist! The key thing to remember is - Exchange provides only the commands necessary to create Exchange recipients. So you have commands like New-Mailbox, New-MailUser, New-MailContact, New-PublicFolder/New-MailPublicFolder, and New-DistributionGroup. However, there are no AD-equivalents like New-User, New-Contact (to create a Contact that's not mail-enabled), New-SecurityGroup or New-Group. Active Directory isn't really PowerShell-enabled, as other components of Windows - like the file system, registry, etc., and Exchange Server 2007 are. There are no AD-related commands (Cmdlet? Shell folks, was it really necessary to introduce another word to the jargon - one that uses the entire word "command"? Perhaps something shorter would've been nicer if you wanted to have a unique word... :-) You can use the Directory Services provider, but that essentially leaves you in VBScript mode, with some PowerShell goodness! A little easier, but not natively shell, as you are used to with Exchange commands. Quest adds these much-needed commands through its free add-on Management Shell for AD. Download it here. Quest has named them so they're differentiated from future commands that will be available natively in PowerShell. For the time being, the quirkiness of typing commands with a Q - as in New-QADUser instead of New-ADUser or New-User - is something we will have to live with, until AD is PowerShell-enabled. Also take a look at PowerShell Community Extensions - it has an Active Directory provider that lets you navigate AD like a file system. One of the frequently asked questions related to Exchange Server 2007's Messaging Records Management is: how do I purge only specific type of items from a particular default or custom Managed Folder, or the entire mailbox? For instance, in many scenarios its acceptable to purge messages from a particular folder or the entire mailbox after a certain number of days, but you don't want to touch users' Contacts, Notes, Calendar items, etc. I've hinted at how to accomplish this in a previous post (read "Managed Folders: How to apply different Managed Content Settings to Default Folders") as a sidebar item. This post directly addresses such questions and scenarios. Let's say you want to purge items that are older than a certain number of days from the entire mailbox, without touching particular type of items. However, if you have restricted the message type to "E-mail", the policy will only take action on email items in those folders. The result: The Managed Content Settings for the "entire mailbox" Default Folder applies to all Default and Custom Folders, but not to the ones you explicitly linked to the same policy. Create new Managed Content Settings for the new folder. Under message type, select "E-mail". You cannot select multiple message types - the only choices are selecting All Mailbox Content, or a specific message type. If you want to apply settings for different message types, create additional Managed Content Settings for the Default Folder and select other message type like Faxes, RSS Items, Missed Calls, etc. - one message type per Managed Content Settings. - Exchange Server 2007: Why aren't Managed Content Settngs applied? Exchange Server 2007's Managed Folders come in two flavors: 1) Managed Default Folders 2) Managed Custom Folders. 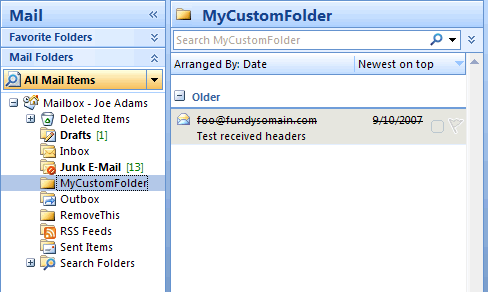 Default folders are the ones created by default in user mailboxes, such as Inbox, Sent Items, and Deleted Items. Custom Folders are the result of a much-requested feature by Exchange folks over the years: Can I create a folder called "Project Blah" in all mailboxes? Exchange setup creates a set of default folders of each type e.g. Deleted Items. These are visible in Organization Configuration | Mailbox | Managed Default Folders tab, or by using the Get-ManagedFolder cmdlet. If Exchange only allows you to associate one Managed Content Settings with one Managed Folder, I've often wondered, why not allow specifying content retention settings in the Properties of that folder? Why have a Managed Folder AND a Managed Content Settings for that folder as separate objects? This is to allow different Managed Content Settings for different types of items in a Managed Folder. For example, for the Deleted Items folder, you can create a Managed Content Setting to permanently delete messages after 30 days, but retain other types of items like faxes or Contacts for a little longer, let's say 60 days. Note: You cannot change the Message Type selected in Managed Content Settings after it is created. To select a different Message Type, delete the Managed Content Settings object and recreate it with the correct/intended Message Type selected. To create a new Managed Content Settings for a default folder, Deleted Items in this case, we need to create another default folder. In the Action pane, click the New Managed Default Folder link. In the New Managed Default Folder page, enter a name for the new default folder instance. Note, unlike Managed Custom Folders, the default folders like Deleted Items, Inbox, Sent Items, Drafts, etc. already exist in a mailbox. What we're doing here is simply creating an instance/representation of a default folder, to be able to associate Managed Content Settings with it. From the Default Folder Type drop-down, select the correct default folder type - for this example we select Deleted Items. [Optional] Type a comment in the text box titled Display the following comment when the folder is viewed in Outlook. The comment will be displayed in Outlook 2007 when the user selects this folder. Click New | click Finish on the Completion page. For more information on applying Managed Folder Mailbox Policy, read previous post "Applying Managed Folder Policy to more than one user". In a previous post, we looked at how the maximum recipients per message settings are treated differently by Exchange Server 2007 and Exchange Server 2003/2000 when sending to Distribution Groups (read previous post "Distribution Groups and maximum recipients per message"). Another commonly asked question is about message size limits and the inability to send messages that are apparently within the maximum sizes configured. Let's take a look at the message size settings in different places. In SP1, you can also set it using the Exchange console by going to Organization Configuration | Hub Transport | Global Settings tab | Transport Settings | properties. Receive Connector limit: Unlike Exchange SMTP Virtual Servers in Exchange Server 2003/2000, Exchange 2007's Receive Connectors are only used to receive messages. The maximum message size limit can be different on different Receive Connectors on a Hub Transport or Edge Transport server. To modify the maximum message size on a Receive Connector using the Exchange console, select Server Configuration | Hub Transport | select a HT server | Receive Connectors -> select a connector | Properties | General tab. Send Connector limit: Send Connectors are used for sending outbound messages to the internet or particular address spaces (domains). Edge Transport servers also have a Send Connector to send inbound messages to Hub Transport servers in an AD Site. To modify the maximum message size on Send Connectors, select Organization Configuration | Hub Transport | Send Connectors -> select connector | Properties | General tab. Mailbox limit: Individual recipients like mailboxes can have their own limits to bypass the Organizational limits. To set these using the Exchange console: Recipients | Mailbox -> select mailbox | properties | Mail Flow Settings tab | Message Size Restrictions. Do individual size limits bypass the Organization size limit? 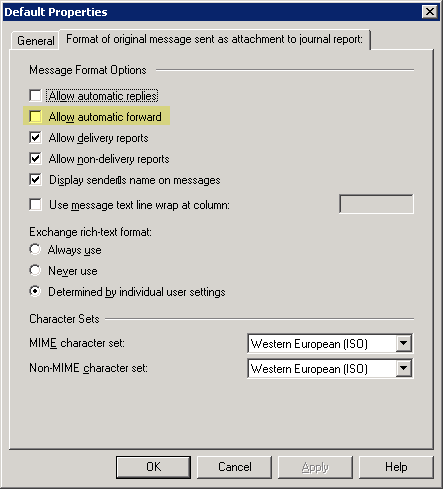 Setting higher message size limits on an Exchange recipient bypasses the maximum message sizes in the Exchange Organization configuration, albeit only for internal messages, not for messages sent to or received from unauthenticated sources. Troubleshooting Sender and Recipient Size Limits: Consider the sender's MaxSendSize and the internal recipient's MaxReceiveSize when troubleshooting message size issues. Distribution Groups and Contacts (MailContacts) only have maximum receive size in the Exchange console, but both MaxReceiveSize and MaxSendSize properties can be set for them using the Exchange shell. Global Settings: Besides the above, another set of message size limits can impact Exchange Server 2007 recipients, but it's often overlooked when troubleshooting. This is the one in Exchange Server 2003 Global Settings | Message Delivery -> Properties. - If you have these configured to a specific value before you upgrade the Organization to Exchange Server 2007, these are left untouched. - If you have these set to "No Limit" before the Exchange Server 2007 upgrade, these are reset to the Exchange Server 2007 defaults. - In case Exchange Server 2007's Organization settings (the ones you can set using Set-TransportConfig) conflict with these legacy Global Settings, the lower of the two sizes are used. The problem is, these are neither visible in the EMC, nor using any of the Exchange shell commands. 1. delivContentLength -> corresponds to MaxReceiveSize parameter in Set-TransportConfig command. 2. SubmissionContentLength -> corresponds to MaxSendSize parameter in Set-TransportConfig command. Note: The maximum value for both of the above is 2097151 KB, slightly under 2 Gb. 3. msExchRecipLimit -> corresponds to MaxRecipientEnvelopeLimit parameter in Set-TransportConfig command. Set these to be the same as the equivalent Organization settings in Exchange Server 2007. Exchange Server 2007 SP1 makes managing Global Settings easier. If Global Settings have numeric values (i.e. aren't set to "No Limit"), using Set-TransportConfig to change maxReceiveSize, maxSendSize or maxRecipientEnvelopeLimit also changes the corresponding Global Settings. One source of confusion in previous versions of Exchange Server, as far as the message size limits are concerned, is that created by the content conversion process. Content conversion happens when Exchange converts an internet/MIME message into MAPI/Exchange format, and vice versa. Content conversion generally increases the message size - roughly by 30%. If you set a maximum message size of 10Mb., and wonder why a 9 Mb. attachment didn't make it through, consider the content conversion overhead, as also message headers (which are computed along with the DATA portion of the message to calculate the message size), and any actions taken by Transport Rules. 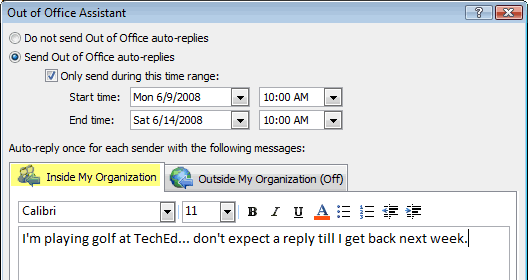 How does Exchange Server 2007 handle such messages? When a message enters the Exchange Server 2007 Org, it gets stamped with an X-MS-Exchange-Organization-OriginalSize header, which indicates the original size of the message before conversion. When considering message size limits, if the message has since ballooned to a larger size due to content conversion, added headers, etc. - the lower of the original message size and the current (converted) message size is considered, eliminating some of the confusion seen with message sizes in previous versions.